Fish of the Month April Entry - Rio Grande Sea Trout! 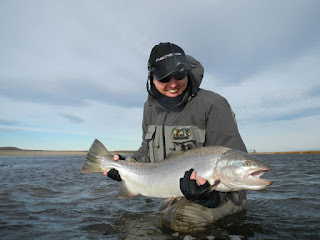 Dee McColgan with an awesome 26lb Sea Trout, caught while fishing the Rio Grande using a 12ft Mackenzie DTX Shooting Head rod and a Heather Shrimp tube fly tied by Ross MacDonald. Dee with his awesome Sea Trout!